Breaking: Baldrige winner Sharp sued by 81 women for secretly filming them undressed and unconscious . . . more at Breaking Badrige. The new 2019-2020 Baldrige (aka, Bloatrige) Criteria have ballooned to more than 1,300 questions as they continue to devolve to a checklist approach to assessment. Is it time to outsource the Criteria writing? Or, is it time to outsource the Criteria writing? Remember these are the same Criteria writers who took innovation out of every Criteria category and stubbornly resisted adding it back in for years. They also took the Supplier Process and Results Items out of the Criteria and again ignored critical feedback for years before reinstating them but at a scoring weight of less than one percent. Culture: Following the lead of the Europeans, organizational culture is given a strong focus. Ironically, culture was previously emphasized in the original 1988 Baldrige Criteria. Senior Leader Communication: Communication with partners has been added . . . what took so long? But, why exclude supplier, community, governing board, shareholder, regulatory/government communication? FYI, the original 1988 Criteria included these . . . one more reason to outsource the Criteria writing. Strategy Effectiveness Results: These are now limited to financial and market results and no longer total in scope . . . does not make a lick of sense? And, the same writers have previously limited the focus to process results, then product results before including them in Leadership results which gave at least gave them a total perspective. Are the 'C' writers floundering here or should we limit how we measure strategy effectiveness? Well, Overseers, we are waiting? Critical Update: The Baldrige Overseers asked NIST to redesign the Baldrige Program! From the perspective of someone whose Baldrige involvement predates all members of the Baldrige Overseers, Judges, Foundation, and NIST staff, I am pleased to see this. At the same time, I would like to know why it took so long. The Baldrige Program has been in steep decline for more than 20 years . . . unless you consider going from over 100 business applicants to zero as a good thing. And, if the same people who have led the decline are charged with leading the redesign, the likelihood of continued decline is high. Consider removing Overseers and Judges who have financial self interests tied to or derived from Baldrige applicants (e.g., consultants). One way to do this is to immediately require a commitment to participate in no financially-related activities while they serve and also for a period of at least five years after their tenure. The appearance of a financial conflict of interest cannot be understated. Sorry, but recusal does not alleviate the problem. Outsource the redesign of the Baldrige Program and use the inputs of the business excellence leaders with a comprehensive understanding from America's high-profile organizations as the input sources. This is what was done in 1987 to develop the first Baldrige Program that was extremely popular and widely accepted and supported by businesses. The award application development process has always been too resource intensive. Little if any improvement has been made for the past 30 years. Making it prohibitive to apply for the award for most organizations and also creating a questionable consultant application writing business do not serve the best interests of the applicants. Does Baldrige consider what the Washington Post sees as a "national embarrassment" worthy of Presidential honor? What if Major League Baseball selected only second-string players from the last place teams for its All Stars Team and honored them as 'role models' for performance excellence in baseball? How is this different from how Baldrige selects its Health Care 'winners'? After all, the US is currently ranked last in health care among large nations (again) and none of the winners are rated "Top Tier" in the US in any of the studies that Baldrige touts. Note: This analogy is not intended to infer that the health care winners are not 'good' hospitals. Much like baseball, the second-string players on the last place teams are still good enough to be in the major leagues. However, the Baldrige Mission is to make the US more competitive. It is not clear to this member of the first Baldrige Board of Examiners how establishing 'good but not great' hospitals from the country ranked worst in health care as role models for excellence is ever going to enable the US to become more competitive internationally as originally intended by President Reagan. MISSION: Accelerating the total organizational improvement rate beyond the capabilities of all Business Excellence approaches combined. Baldrige Improvement Insight: Contrary to what you may have heard or read, Baldrige is not an improvement process. 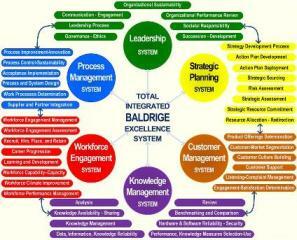 Rather, Baldrige is and always has been an assessment methodology. Assessment is an important 'early' phase of a multi-phase systematic improvement process. A valid assessment including actionable feedback does not inform on "how" to achieve improvement. In fact, Baldrige assessments have always been "non-prescriptive" by design. Breaking Badrige: The news is not so good for Baldrige in the US and internationally . . .
And, Baldrige Winner Montgomery County Public Schools is in the news for all the wrong reasons . . .
Eleven is a charm! Congratulations to the world's only five-time national award winner!!! Vodafone was my 11th telecommunications client in 11 different countries. I am pleased to report that all eleven achieved their project objectives . . . which for most of them was to win their national quality/excellence award . . . thank you Vodafone for keeping the streak alive . . . and, thank you for the special honor of inviting me back again in 2016 to work with a truly outstanding organization that never stops improving. Vodafone Fiji is a 5-time national excellence award winner that applies every three years . . . they may be the benchmark for all other national excellence award winners. Is Baldrige still about World Class Excellence? There was a time that 'world-class' process performance and results were literally assessment requirements in the Criteria . . . not anymore. US healthcare is ranked last among large nations and none of 20 Baldrige HC Award winners are ranked as top tier providers based on the (Truven Health Care Analytics (Top Hospitals Everest Award) or US News & Report HEALTH (Honor Roll Award). The Mission of the Baldrige Award Program is to improve American competitiveness . . . this can only be done by focusing on achieving world-class performance. The Secretary of Commerce appears to be steering away from the Mission when lower tier health care organizations are honored as “role models” for excellence. Establishing lower tier organizations as role models appears to obstruct achievement of competitiveness. If the Award was refocused on world-class excellence (its Mission), the original integrity of the Award could be restored. And, holding Baldrige once again accountable to a world-class competitiveness Mission, may result in something much more important than making America more competitive and saving trillions of dollars . . . it can save countless lives . . . the time to refocus the Baldrige Health Care Award away from 'local class excellence' and back to world-class competitive excellence needs to happen now . . .
Another Health Care Embarrassment for the Baldrige Award? Was Texas Health Presbyterian Dallas (the hospital at the center of the Ebola controversy) selected for a site visit at the time that their first of three Ebola victims was there? . . . and did they cancel the Baldrige Site Visit? The Dallas Morning News reported: "Presbyterian loses shot at national award amid Ebola case disputes"
A 'Site-less' and 'Visit-less' Site Visit? : Let's hope not . . . but, The Dallas Morning News article also reports something that if correct may be particularly troublesome for the integrity of the Baldrige Award: "Hospital spokesman Wendell Watson said late Saturday that Baldrige officials had expressed concern about its staff’s safety but considered replicating the visit with telephone interviews." If true, an offer to replicate a site validation visit with telephone interviews is unprecedented, inconsistent, and would have given unfair advantage to Texas Health Presbyterian Dallas. We may never know with certainty if this actually occurred because information related to site visits is appropriately confidential . . . so, maybe the Commerce Department should consider an independent investigation to determine if what was reported is accurate. Hopefully, an offer to do a telephone site visit was incorrectly reported and never occurred but it is important to the image and integrity of the award that the Commerce Department know with certainty what actually occurred and that they inform the public to the extent that is appropriate. Baldrige and Health Care . . . was the separate health care award category strategy introduced several years after the business-focused award program flawed from the beginning? Baldrige was established to be a "Business" Award: So, why is the Commerce Department sponsoring a separate "health care award" when the Baldrige Award was established by President Reagan for businesses? In fact, that is the reason it was located within the Commerce Department. 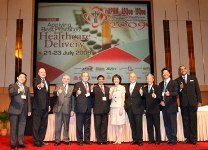 Why not consider heath care organizations as 'service' organizations as is done in the leading Asian, European, and Middle East Award Programs? Or, is there fear that doing this would result in no 'health care winners'? . . . let's hope not but, if that is indeed true, health care organizations may benefit by understanding how much they need to improve. More importantly, it may help to restore the prestige of the Baldrige Award to the high level it deservedly earned during its early years. Has the bar for winning the Baldrige Health Care Award been lowered from 'World-Class Great' to merely 'Community Good'? Good not Great? : There are no Baldrige Health Care winners among the Honor Roll (top 17) US HC organizations listed in US News and World Report HEALTH (September 2014) or the 2014 Truven Health Care Analytics "Top Hospitals Everest Award"
3 New HC Winners at the Bottom: Texas is rated by as being in the bottom quartile of "The States With the Worst Healthcare Systems" by The Commonwealth Fund (May 1, 2014) . . . yet Baldrige awarded it highest award to three HC organizations from Texas . . . a fourth Texas HC organization was selected as a finalist in 2014 but the cancelled due to first Ebola patient being there. Why not require evidence of World-Class Performance as was done in the early years of the award? On what basis did the US Secretary of Commerce announce them as a Baldrige winner and cite them as a "role model" of excellence? Hopefully, the circumstantial evidence above is not representative of Baylor-Plano overall and that we will learn more about the root cause . . . so far, we have not learned more which leaves the impression that those involved are hoping it will go away with time. Suffocating Criteria Complexity: 1,100+ separate Criteria requirements (questions) to be answered within a 50 page limit. This represents an increase from 985 individual requirements (questions) in the Criteria previous 2014 version. How else could innovation have been taken out of all Criteria Items and years later reinstated? Does anyone believe that the Judges and Overseers agreed to this? How else could 'work systems' have been relocated to 6 different Categories and 13 Items? For some, there is no more compelling argument than this that the business excellence plot has been lost. How else could 'projections' be mistaken for 'results', positioned in the Results Scoring Guidelines, and scored as results? How else could 'customer relationship building' have been trivialized? How could 71 separate Criteria requirements/questions based the word 'engage' be added but only in two of the seven Categories. Faux Innovation: The Baldrige definition for innovation (page 49-50 of the 2015 Criteria booklet) is a well-written and worthy definition for 'benchmarking' but not innovation. The operative verb ("adopt") is the problem. The word innovation comes from Latin and means "new, original". Baldrige was for Innovation before they were against it: The Criteria started in 1988 with Innovation included literally in every Item. To the astonishment of users, 'innovation' was subsequently deleted from all Items except Item 1.1 for several years. Years of complaints led to innovation being reluctantly reinstated . . . but not really because now 'innovation' has been incorrectly defined as 'benchmarking' and the Examiners are required to use this flawed definition. Here is a fix to consider: Build the existing faux innovation definition around the verb "create" and not "adopt". Then add the word "you" in front of create. Pixie Dust Approach to Innovation: Although a systems perspective is touted, the reinstatement of innovation in recent years consists merely of sprinkling particles of innovation dust on the Criteria . . . the innovation 'process' question/requirement was deleted from the 2013-2014. Process Deficiency: Narrowing the focus of Category 6 from all processes to only operational processes has been a mistake from the perspectives of some. Taking the position that a "work process" is not a work process if the work is done by a supplier is . . . (fill in the blank). Categorizing 'support processes' as 'operational' is . . . (fill in the blank). Business Excellence . . . No Longer: Believe it or not, the Baldrige Criteria were once widely admired as the leading model for business excellence worldwide. Today, it appears to many that the Criteria are no longer compatible with the fundamentals of 'Business Excellence'. The reasons for the demise are numerous but the convoluted confusion that are 'work systems' and work processes' represent one of their most enduring flaws. You can find an ongoing analysis of all the changes including additions, deletions, and historical notes dating back to my first year as an Examiner in 1988 at: Baldrige Criteria Changes both good and not so good. You will also find the Criteria flaws . . . past and present. The Criteria have become exceedingly complex and therefore not practical. This discourages their use. For example, there were 71 separate and distinct questions (requirements) that literally use the word 'engage' for customer and employee stakeholders. However, there are no questions using the word 'engage' for other types of stakeholders including, suppliers, shareholders, community, or board of directors. We can all agree or disagree with the reasons for the decline. What is clear is that the Criteria purport to offer a means to improve organizational performance excellence. And, profit organizations are desperately in need of and open to a means to improve their performance. Defiance of the basic laws of economics: There is the ideal market scenario with both inexhaustible supply and unquenchable demand . . . but, something [arguably the Criteria quality] has not only prevented growth in the number of 'for profit' applicants but caused a steady exodus for the past 20 years. What follows is a summary of Criteria improvement opportunities (OFIs) identified by users including winners, Examiners, Judges, former Baldrige Foundation Chairman, national award leaders, and an advisor to two US Presidents. Everyone wants to see the Baldrige Program regain its former stature. Please Note: This summary of the new Criteria changes is being continuously updated. It is possible that in some cases the findings presented may be incorrect. However, if the Criteria are correct and the perception is that they are not, there would appear to be an important opportunity for the Criteria to better communicate to the users. How many words is too many? There are 5, 878 words in the 2013 Criteria and 4,595 additional words in the explanatory notes under the Criteria. Some users think this is too many. For example, there are 71 separate and distinct questions (requirements) for customers and workforce that literally use the word 'engage'. Do we really need more than a couple of well-written engagement questions? Reinstate 'world-class': As Baldrige celebrates its 25th anniversary, it may want to consider reinstating the original 'world-class' requirement in both processes and results scoring guidelines. America ranks lower internationally in manufacturing, health care, and education than it did when the Baldrige Program began in 1988. Lowering the competiveness bar for winning to national or regional benchmark levels is not compatible with the award' original purpose and is not the best approach to improving America's competitiveness. Reinstating the original 'world-class' threshold will result in fewer winners but State and international excellence award programs have addressed this effectively by using tiered award levels. 'Work Systems' have been moved from Operations Focus to Strategic Planning. During the past 20 years, Work Systems have been relocated to the Criteria requirements in 13 Criteria Items, the Organizational Profile, and six of the seven Categories. Work Systems never-ending quest for a permanent home has long confused and frustrated users. Confusion and frustration are not conducive to improvement. These relocations appear to some to make a compelling argument that the Criteria writers do not know what 'work systems' are or where they belong in the Criteria. ACTION: The time to remove 'work systems' from the Criteria is long overdue. Problematic: In the Criteria, the design, development, implementation, control, improvement, and sustainability of approximately 95% of the 'key processes' of a large manufacturing organization (e.g., automotive) are not included in the Criteria 'work processes' or 'work systems' requirements because they are performed by suppliers? 'Support Processes' are back after a 6-year absence and they are now located in the Operations Focus Category which is problematic for some who view support processes to not be constrained to being operationally focused. Support processes (AKA, 'support services') enjoyed their very own Criteria Item from 1992 through 2004 before sharing an Item with Operational Planning in 2005 and 2006.They met their Waterloo after 15 years of loyal Criteria service when the 'less than precisely defined' 'Value Creation Processes' were introduced under the definition that 'Support processes' are not 'value creation' processes. The protest by support process members who passionately believed that their processes created value for their organizations was unsuccessful. They were never to be seen or heard from again . . . until now. Caution: If you are optimistic that the Criteria learned from the previous issue related to their not being Value Creation processes then by all means don't read the notes under the new Item 6.1. Did you know? : 'Support processes' are not part of 'work processes', 'value creation processes', or 'work systems' . . . if they are performed by members of your workforce? Work Process Confusion Acknowledged: In late 2012, the Baldrige Program publically acknowledged after decades of feedback that the term 'work process' was confusing Criteria users. However, it appears that no improvement action has been taken. At the heart of the concern related to 'work processes' is the Criteria definition that work done by members of your organization is part of a 'work process'. But, if the same work is done by a supplier, it is not part of a 'work process'. Now you see them (Work Processes)! . . . Now you don't! Some users perceive that the relationships between and among 'work process' and 'work system' are convoluted or in some cases invalid. Here is an example: A 'work process' is defined as being performed internally. The same process when performed by a supplier is (as of 2013) included under 'work systems' in Strategy Development. If the same process is performed internally, it is required to be assessed for design, development, implementation, control, improvement, and sustainability. However, these requirements are not part of a Baldrige assessment if a supplier performs the work. 'Do or Source' Decision: Sourcing decision-making of 'key processes' (undefined term) is strategic in nature and has appropriately been moved from the downstream 'Operations Focus' Category upstream to the 'Strategic Planning' Category. In addition to processes, organizations do other sourcing including materials, components, and services. In the case of a manufacturing organization, this may represent more than half of their total expenditures. However, it does not appear that the Criteria include how this non-process sourcing is addressed. Selection of suppliers which is different from sourcing decision-making is addressed downstream in 'Operations Focus'. However, supplier selection is often a critical upstream function especially if it relates to innovation or new products, services or programs. For example, new product proposals need to determine if the new product can be reliably and economically made shortly after the Concept Phase. Business Processes??? Business processes are included in the definitions for both Work Processes and Work Systems . . . but what exactly are business processes? The Criteria do not define what 'business processes' are. Using a term (e.g., business processes) that is defined differently by different people and/or organizations to define Work Systems and Work Processes can only add to the already high level of confusion concerning 'work processes'. Taking the "Total" out of 'Total Quality': The 'Cost Control' Criteria area has been refocused from 'work systems' to operations in general . . . that is arguably an improvement. But, some may be curious as why the Process Items Criteria do not directly address cost control on a total organizational basis. Innovation was banned from the 'excellence' Criteria: The very first Criteria featured innovation as a means to improve organizational competitiveness in the requirements in at least one Item in all Seven Categories of the original Criteria. In fact, it was literally included in the title of each of those Items and Categories. Innovation Dark Ages: During the the 1990's, the Criteria totally de-empathized innovation. Taking innovation out of the Criteria stunned the business users who refused to accept that innovation was not part of excellence. For 2013, innovation has been reinstated into at least one Item in every Criteria Category. But, the Criteria writers suffered multiple bullet wounds to their feet by incorrectly using the definition for benchmarking to define innovation. Hint: Innovation means "new" not "adopted". The new 'Innovation Management' area in "Operations Focus" is a promising addition . . . except the 2013 Criteria deleted the most important Criteria question from the 2012 Criteria . . . 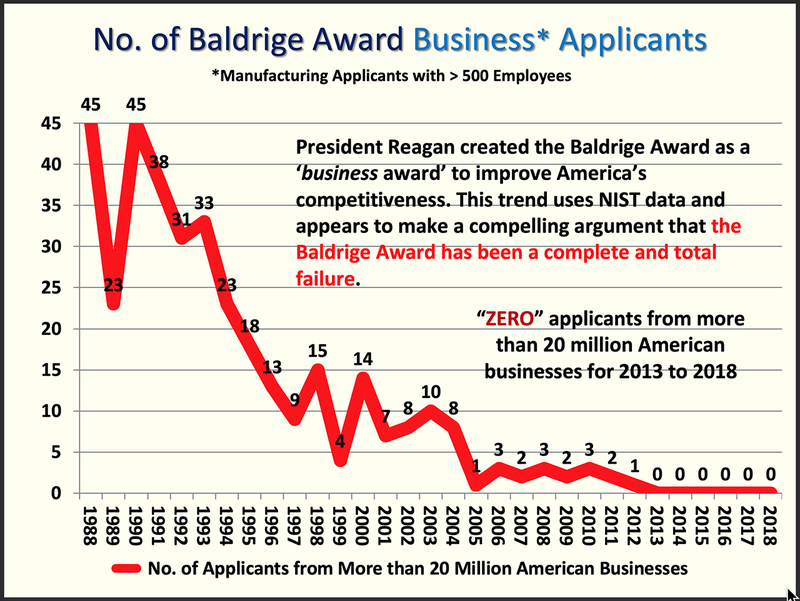 There would not have been a Baldrige Award if it were not for suppliers: President Reagan was concerned that the Baldrige Award Program could fail if it did not receive wide support from the manufacturing community. He required that financial support for the award be funded 50% by manufacturing suppliers as a condition for his support. For every $300,000 asked from each major manufacturing sponsor organization, it was required that there be an additional $300,000 from their suppliers. Most Baldrige applicants in the early years were suppliers: The chart at the top of this page paints a bleak trend for manufacturing/supplier applicants . . . from nearly 100 in the early years to only six in 2012. Baldrige stunned the business community in 2001 by deleting all Process and Results Criteria Items, Areas, and Criteria questions dedicated to suppliers. This led to the December 2001 Quality Digest Magazine cover titled: "Is the Baldrige Award Still About Quality". The feature story was written by Richard J. Schonberger a world-acclaimed author and expert in the field of Lean - Six Sigma and World-Class Manufacturing. He cites several flaws in the Criteria including the removal of the Items dedicated to suppliers. Dr. Schonberger's position accurately reflected the sentiment throughout the business community that sustained the already declining award participation rate of the business community. Today, a consensus is growing in other sectors including education and health care that it is important for the Criteria to accountably address the supplier and partner organizations that represent on the order of 50% of their total expenditures. These costs often take the form of management, design, HR, maintenance, contract workforce, IT, customer support, and operational functions. Good News (sort of): For 2013, Supplier-dedicated Criteria Areas (not Items as before) have returned to the Criteria. This marks a significant first step towards restoring the importance of suppliers in achieving excellence. More pressure needs to be applied to restore the Criteria to their previous supplier recognition level in years 1988 through 2000 but even that will be insufficient. Suppliers and partners are not second class stakeholders. Give them equal status with other major stakeholders (e.g., workforce, customers) by adding a dedicated Suppliers and Partners Focus Category and a corresponding results item. Doing this will establish applicant accountability to addressing these valuable stakeholders. The winners’ application summaries (especially healthcare) make a compelling argument that to win the Baldrige Award it is no longer necessary to meaningfully address supplier and partner organizations . . . nobody wins when the value of suppliers is minimalized. Have the Baldrige Case Study writers 'lost the plot'? Warning: The answer is graphic in nature. Viewer discretion is advised. Eliminate the words "Innovation involves the adoption of . . ." from the definition for Innovation to ensure a focus on new and not copied improvement. Why? The word innovation comes from Latin word ‘nova’ which means new. The Baldrige definition for innovation is based on the action verb “adopt” which does not have the same meaning as new. Adopting something that is not new and defining it as innovation because it is new to the adopting organization does not make something that is already used . . . ‘new’. For example, one Baldrige winner adopted a process that had been used previously for more than fifty years and presented this in their application and in post-award presentations as innovation . . . not good. However, I suppose that one could salvage some face-saving value by arguing that at least this was an innovative application of an old process. But, that is not simply not good enough for a role model winner. The point is that the organization should not be faulted . . . rather, the Baldrige definition is the enabler of this degradation. From another perspective, it is difficult to imagine how the 2012 ‘adopt’-based definition for ‘innovation’ differs from the Baldrige Glossary definition for ‘benchmarking’. Further, it appears that Baldrige may have mistaken corrective action for innovation in the Criteria Booklet graphic to the left. Most importantly, allowing imitation to be credited as innovation adversely affects the competitiveness and improvement rate of organizations using the Criteria. - Thousands more people trained in Self-Assessment than the Baldrige Award Program! I am especially grateful to Fiji National University National Training and Productivity Centre (NTPC) and to Public Service Commission (Office of the Prime Minister) for inviting me and appointing me as a faculty member to train the Fiji Business Excellence Award Evaluators and the government's Service Excellence Award (SEA) Evaluators during May and June of this year. This is the only government that I am aware of that is using the Baldrige Criteria to assess and improve every Ministry, Agency, and Department including the Office of the Prime Minister and the Office of the President. As a consultant, it does not get any better than being selected by the Asian Productivity Organization (APO) to guide the development of the Asian Productivity Organization's Business Excellence Consulting Manual to train the Business Excellence Consultants in most Asian nations including members from Japan, Singapore, Malaysia, Philippines, Mongolia, Thailand, Fiji, Taiwan, India, Cambodia, Vietnam, Sri Lanka, and Pakistan. Serving as the International Assessor on Singapore Quality and Innovation Award site visit teams for three years has been very enjoyable and fulfilling. Baldrige Training → thousands more people trained than the Baldrige Award Program! 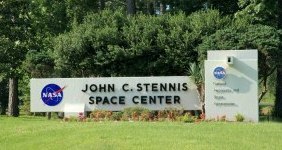 Working with NASA to improve their strategic planning was most fulfilling . . .
Examiners received an invitation from the President of the United States to join him at the White House for the official award presentation. Your fellow Examiners were truly a 'Who's Who' of top quality executives from many of America's largest businesses . . . not that it necessarily made them good Examiners . . .
You received personal letters thanking you for your service from some of America's best known CEOs . . . and. your name appeared in full page ads in the Wall Street Journal and similar prestigious publications. Unlike today's easier standard, 'world-class' processes and results were part of the requirements in the top scoring band.